Born and bred in Melbourne, Funky Trunks is an Australian Swimwear and Underwear label for guys who want to make a statement. With crazy colours in comfy styles, Funky Trunks is designed for serious performance without the serious attitude. In October 2002 the first pair of Funky Trunks swim trunks were launched unceremoniously at a suburban Melbourne pool by national swimmer Duncan McLean to a chorus of laughter and cheers from the squad. As you might imagine, pink flowery trunks were unheard of in an era where Speed-O had ingrained the necessity for males to exercise only navy, black or red. It was hardly the springboard for a budding swimwear label but as the jokes died, the Australian male inclined to swim laps began to question the appeal of exercising in tight briefs. 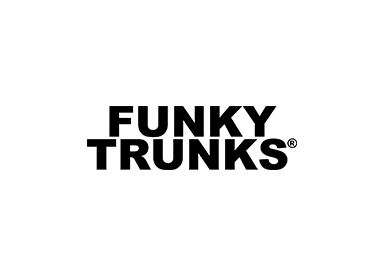 After a few years of research and development, not only did the swimwear develop, but Funky Trunks underwear was also born. The Funky Trunks underwear was created for men, from premium cotton elastane fabric that ensures breathability and prolonged comfort, while the smooth waist elastic provides a firm hold and fit.